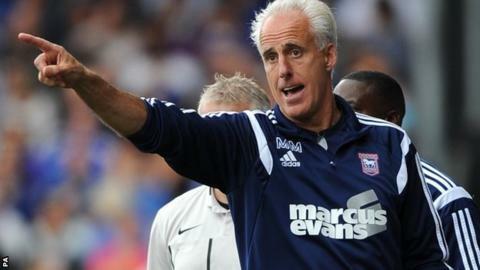 Mick McCarthy's Ipswich are now unbeaten in three and sit in the Championship top 10. Jonathan Parr's first goal in more than two-and-a-half-years, and a stunning effort from Daryl Murphy, gave Ipswich their second 2-0 home win in four days. Brighton went the same way as Millwall on Saturday after a deserved win for the Tractor Boys, who moved up to ninth in the Championship. Parr broke the deadlock on 79 minutes after forcing home a rebound. And Murphy's audacious first-time shot from an acute angle with two minutes remaining sealed the three points. Mick McCarthy's Ipswich side had four points from their last two games going into this encounter with a Brighton team looking to bounce back following a 3-2 defeat at Brentford at the weekend. It was the hosts who came closest to an opening goal, when in the 26th minute Murphy burst clear, only for the Ipswich frontman to clip the top of the crossbar. Brighton responded well, with Kazenga Lua Lua's neat lay-off met by Sam Baldock, whose low 20-yard shot was superbly tipped away by keeper Dean Gerken. Gerken was again called into action after the interval when Lewis Dunk's header met Danny Holla's corner, but the centre-back could find no way through. The game was stretched and with both keepers regularly tested it took a mistake to break the deadlock. Great work down the left by Ipswich led to Jay Tabb's shot being smothered by Brighton stopper David Stockdale, only for Parr to bundle home the rebound. And the win was made safe at the death when full-back Tyrone Mings' long ball down the left was chased down by Murphy, whose excellent first-time shot from outside the 18-yard box found the far corner. "Tyrone Mings showed why I wanted him in my team, why I wanted him at this club, and why he wasn't for sale [in August]. "He wasn't going anywhere and no amount of euros or pounds was going to make a difference. We picked him up from relative obscurity and helped him become a player. Now I want him to help us become a good team." "I am not too unhappy about the performance but of course I am unhappy that we lost - I want to win every game. "The players want to win games but that time will come. We need to get some points but the league position doesn't really matter at the moment. But I know we are already a bit behind and we can't fall too behind." Match ends, Ipswich Town 2, Brighton and Hove Albion 0. Second Half ends, Ipswich Town 2, Brighton and Hove Albion 0. Attempt missed. Joe Bennett (Brighton and Hove Albion) left footed shot from outside the box misses to the right. Assisted by Jake Forster-Caskey following a corner. Corner, Brighton and Hove Albion. Conceded by Christophe Berra. Jonathan Parr (Ipswich Town) is shown the yellow card for a bad foul. Kazenga Lua Lua (Brighton and Hove Albion) wins a free kick in the defensive half. Corner, Ipswich Town. Conceded by Bruno. Substitution, Ipswich Town. Conor Sammon replaces David McGoldrick. Goal! Ipswich Town 2, Brighton and Hove Albion 0. Daryl Murphy (Ipswich Town) left footed shot from a difficult angle and long range on the left to the bottom right corner. Substitution, Brighton and Hove Albion. João Teixeira replaces Danny Holla. Danny Holla (Brighton and Hove Albion) wins a free kick in the defensive half. Attempt saved. Kazenga Lua Lua (Brighton and Hove Albion) right footed shot from outside the box is saved in the centre of the goal. Assisted by Danny Holla. Attempt saved. Jay Tabb (Ipswich Town) left footed shot from outside the box is saved in the centre of the goal. Gordon Greer (Brighton and Hove Albion) is shown the yellow card for a bad foul. David McGoldrick (Ipswich Town) wins a free kick in the attacking half. Foul by Gordon Greer (Brighton and Hove Albion). Attempt missed. Kazenga Lua Lua (Brighton and Hove Albion) right footed shot from outside the box is high and wide to the right. Assisted by Adrián Colunga. Corner, Brighton and Hove Albion. Conceded by Luke Chambers. Goal! Ipswich Town 1, Brighton and Hove Albion 0. Jonathan Parr (Ipswich Town) right footed shot from the centre of the box to the high centre of the goal. Attempt saved. Jay Tabb (Ipswich Town) left footed shot from the centre of the box is saved in the centre of the goal. Assisted by Tyrone Mings. Attempt missed. Joe Bennett (Brighton and Hove Albion) left footed shot from outside the box is too high. Hand ball by Cole Skuse (Ipswich Town). Kazenga Lua Lua (Brighton and Hove Albion) wins a free kick in the attacking half. Attempt saved. Tyrone Mings (Ipswich Town) right footed shot from the left side of the box is saved in the bottom left corner. Assisted by Daryl Murphy. Substitution, Ipswich Town. Luke Hyam replaces Teddy Bishop. Substitution, Ipswich Town. Alex Henshall replaces Paul Anderson. Substitution, Brighton and Hove Albion. Adrián Colunga replaces Craig Mackail-Smith. Delay in match Sam Baldock (Brighton and Hove Albion) because of an injury. Attempt missed. Danny Holla (Brighton and Hove Albion) right footed shot from outside the box is too high. Assisted by Craig Mackail-Smith. Attempt missed. Jake Forster-Caskey (Brighton and Hove Albion) left footed shot from more than 35 yards is close, but misses to the right. Assisted by Sam Baldock. Corner, Ipswich Town. Conceded by David Stockdale. Attempt saved. Tyrone Mings (Ipswich Town) left footed shot from very close range is saved in the top left corner. Assisted by David McGoldrick with a cross. Kazenga Lua Lua (Brighton and Hove Albion) is shown the yellow card for a bad foul.